Sculptor Kim Shaklee, a successful wildlife and marine sculptor, distinguishes herself from other artists by her ability to transform static metal into fluid motion to capture the essence of an animal. A native of Colorado, Shaklee developed a deep appreciation for the natural world, and an intense love for wildlife. Her father was also quite artistic, and encouraged Shaklee to draw and paint the creatures she encountered as a child. This formed the foundation for her future to become a sculptor. Regarding her artwork, Shaklee says, "It is the emphasis I place on interpreting the personality of the subject that ties all my work together. My desire is not merely to replicate the image of an animal but rather to make its essence the central focus of the piece. I truly love these creatures, and I want anyone who views my bronzes to be able to see the individuality of each animal through them." Shaklee's works have been shown in many national and international exhibitions and are included in permanent collections around the world, including the Smithsonian Institution's National Zoological Park (Washington, D.C.) and the Oklahoma City Zoo (Oklahoma City, OK). Shaklee is an elected member of the Allied Artists Of America and the American Artists Professional League. Additionally, she is a signature member of the American Academy of Women Artists, the Women Artists of the West, and the prestigious American Society of Marine Artists. 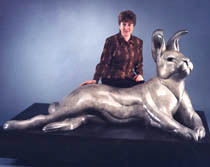 Sculptor Kim Shaklee sits with her monumental rabbit sculpture "International Harvester" A.K.A. "Harvey".